A four-lane highway project that aims to connect the Seven Mountains region of Pennsylvania to the greater State College area through Centre County is being restarted after being shelved for more than 15 years – largely with state funds. 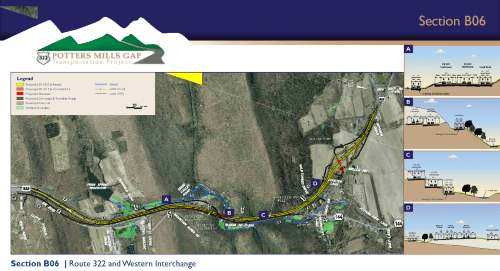 The new roadway would also link to the Potter Mills Gap project, which is in its final stages, according to the Pennsylvania Department of Transportation. “This connection has been a significant local priority for some time and was studied in detail but was unfortunately shelved in 2004 due to lack of federal funding,” said Pennsylvania Gov. Tom Wolf in a statement on Feb. 13. “So, in the absence of federal investments that we were all promised, today, I’m happy to announce that we are taking steps to make a long-awaited connection project a reality,” he added. PennDOT said it is committing $5 million to begin preliminary engineering this year on this “complex” highway project through Centre County that will require “extensive collaboration” with local communities, businesses, and others through the design, utilities, and right-of-way phases. The agency said it is targeting 2027 to begin construction. PennDOT added that it is using “discretionary funding” to make the project a reality without changing overall transportation project plans. The proposed corridor involves Route 322, Route 45, and Route 144 in south central Centre County, where truck traffic has increased 37 percent between 1999 to 2016. Phase Three: Reconstruction of U.S. 322 from Potters Mills to Sand Mountain Road including the western interchange and the local interchange at a cost of $82.3 million; bid in late March 2018 and expected to open to traffic in late 2020. Stakeholders and community members in south-central Centre County have long desired a four-lane connection that would increase safety and mobility in the often-congested area, noted Sen. Jake Corman, a member of the state legislature, in a statement. “This project is of great importance for Centre County, for the thousands who travel this road every day and for the hundreds of thousands who travel this stretch throughout the year,” he said.